These kabobs are packed with flavor and the bright citrus notes from both lemon juice and lemon zest really make it refreshing. Garlic, white wine and oregano round out the flavors and the chicken marinates in this mixture for at least an hour. I prepared it in advance where the chicken marinated overnight, which I think allowed more flavor to be absorbed by the chicken. You could thread these with your choice of vegetables but we prefer chicken skewers on it's own with the vegetables skewered separately. Although we made these for our party, we liked these kabobs so much we made them again for dinner the other night. These are great with your favorite rice or couscous side dish but we enjoyed these with mixed greens and a simple vinaigrette. In a large bowl, combine the lemon juice, wine, oil, garlic, oregano, lemon zest, salt and pepper. Add the chicken; cover and marinate in the refrigerator for 1 hour. Meanwhile, prepare an indirect-heat fire in a covered grill. Place 8 wooden skewers in water to cover and let stand for at least 15 minutes. When the fire is hot, drain the skewers and thread the chicken. Place on the perimeter of the grill rack directly over the fire. Grill, turning the skewers once or twice, until the chicken is browned, about 5 minutes total. Move the skewers to the center of the grill rack so they are not directly over the fire. Cover the grill, open the vents halfway, and cook, turning the skewers occasionally, until the chicken is opaque throughout and the juices run clear, 10 to 15 minutes more. 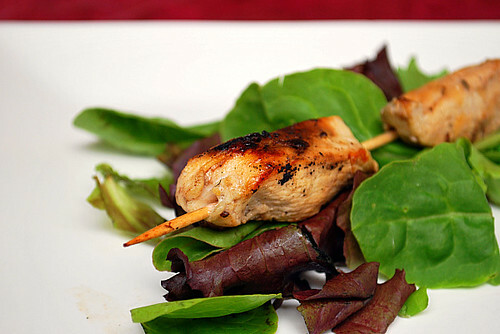 Transfer the skewers to a warmed platter or individual plates and serve with the lemon wedges. I love a good kabob. I love the recipe.